Hot Shot’s Secret Introduces Two-Step Oil System Treatment - Lubrication Specialties, Inc.
Mt Gilead, OH (November 19, 2018)…Hot Shot’s Secret, a leading brand of performance oil and fuel additives manufactured by Lubrication Specialties Inc., introduces a powerful Two-Step Oil System Treatment safe for gas and diesel powered vehicles. When used as directed, the two-step oil system treatment provides four major benefits: improved power and compression, reduced lifter and valve noise, reduced engine wear, and an increase in fuel economy. 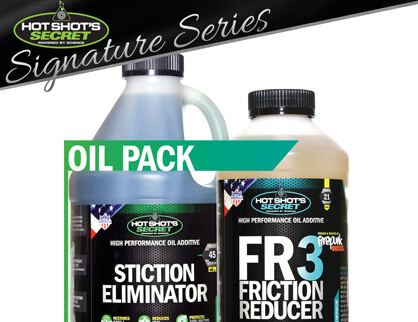 Following Stiction Eliminator, Hot Shot’s Secret recommends adding their FR3 Friction Reducer on the next oil change at a ratio of 1.5 ounces to every 1 quart of oil for long-term engine performance, restored power and improved MPG. FR3 is a synthetic friction reducer with three patented technologies. The formula uniquely contains patented synthetic lubricants with lubricating properties compared to PAO or mPAO synthetics of the same viscosity. The anti-wear component of the formula is a proprietary carbon nano particle that fills in microscopic irregularities on the machined surface to provide a smoother surface for the lubricating film to form. The result of using the Hot Shot’s Secret Two Step Oil Treatment is a newly cleaned oil system now fully protected for maximum long term performance. Combined, the treatment first thoroughly cleans the engine’s oil system, then with FR3 added extends the base oil performance in shear stability, oxidation stability and film strength. Test results demonstrate a reduction in friction that can cause power robbing heat and improved fuel economy up to 5%.